Sometimes it can be difficult to teach children about saving money, especially if they have their mind set on buying something that their friends have, and which they too want to own. Even if you tell them that saving their money will result in them having more to spend later, you're unlikely to have a very receptive audience. 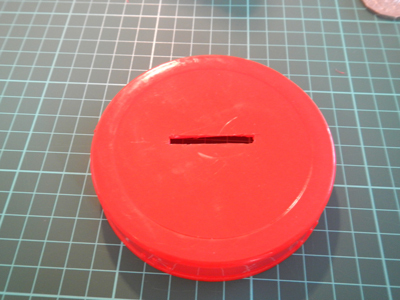 There are many money boxes available to buy that can help make the saving process easier, but unless you want a plastic novelty box of their favourite television or film character, a metal tin with banknotes on it from a souvenir shop or a moneybox emblazoned with bank logos, you're not going to find anything appealing to younger children. 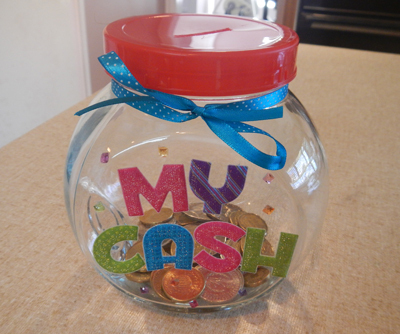 This decorated money jar is the ideal solution and best of all, it's cheap to make. Simply buy a glass or plastic container from your local $2 shop or op shop and some bits and baubles to decorate it with. Once you have made a hole in the lid for the coins, the kids can have a field day decorating the container to their liking. It's safe to say that they'll be more likely to save their money and fill their jar if they've decorated it themselves. 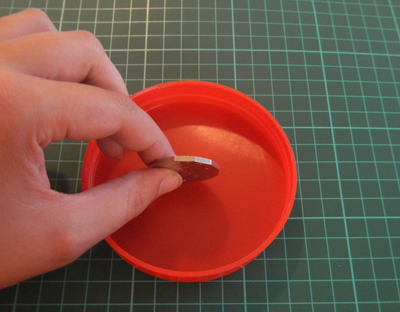 Unscrew the lid from your jar or container and place it upside down on the cutting mat. Go and find a 50 cent piece (or the largest coin that you will be placing inside the jar). 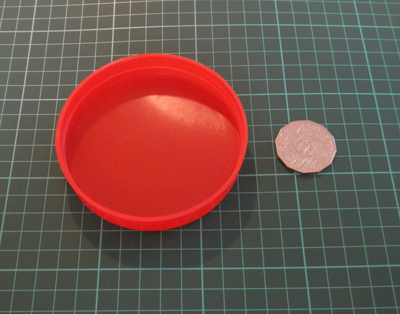 Find the centre of the lid and place the coin there. 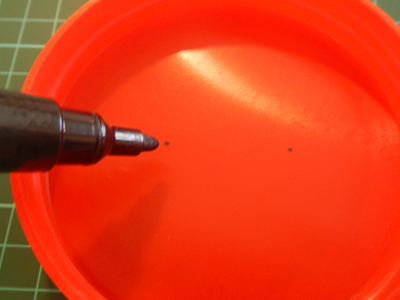 Mark the spot where the coin is using a permanent marker. 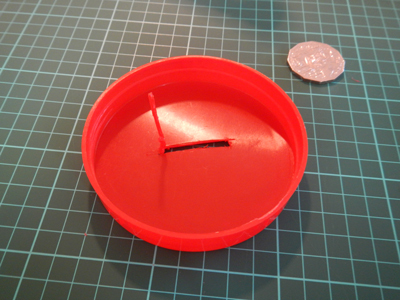 This will help you make sure that the hole you cut is in the right place, and is the right size for all of your coins. It's best if an adult does this part, as it can be quite difficult to cut through the plastic (no matter how thin it appears) and we don't want any accidents with sharp blades! 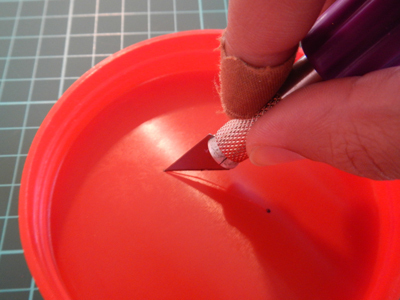 Using the hobby knife, carefully cut the plastic between the dots that you have marked on the lid. It may take quite a few goes to get the blade completely through the plastic, but once you have, it gets a lot easier. Trim the edges of the hole you have cut to make it look straighter and neater. You should be able to easily slip your largest coin through the gap, without it catching on the edges of the hole. Now the hardest part is over and the fun part begins- decoration! 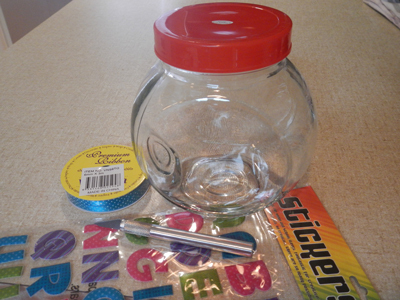 Decorate the jar or container in whatever way you please- you can use stickers to personalize the jar and write your name on it, or you can do whatever design you like. 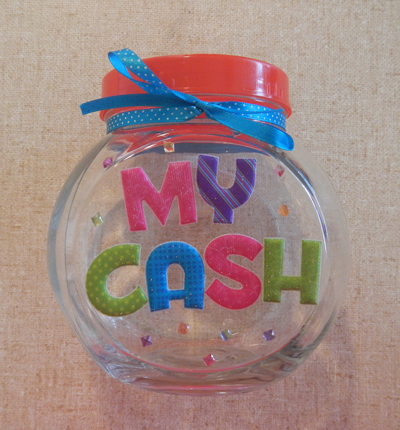 I chose to use scrapbooking stickers to write 'MY CASH' on the jar, decorated it with bright and sparkly diamontes, and tied a pretty spotted bow around the neck. The possibilities for decoration are endless! Great idea. I actually use this for myself. I don't have anything decorated on the jar, but I used old Cath Kidson labels to 'decoupage' the lid. I put it in single quotations because I actually just used magic tape. but it looks great.